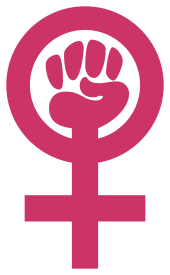 The term has been used since the beginning of second-wave feminism to refer broadly to any recent manifestation of feminist activism, mainly to distinguish it from the First-wave feminism of the suffragettes. It was used in the title of a best-selling 1982 book by Jacques J. Zephire about French feminist Simone de Beauvoir, Le Neo-Feminisme de Simone de Beauvoir (Paris: Denoel/Gonthier 9782282202945). Zephir used the term to differentiate de Beauvoir's views from writers described as "Neofeminist", such as literary theorist Luce Irigaray, who indicated in her own writing that women had an essentialist femininity that could express itself in écriture féminine (feminine writing/language), among other ways. Céline T. Léon has written, "one can only identify the existentialist's [de Beauvoir's] glorification of transcendence with the type of feminism that Luce Irigaray denounces in Ce sexe qui n'en est pas un: "Woman simply equal to men would be like them and therefore not women"." The term has also been equated with the New feminism described by Pope John Paul II. ↑ Leon, Celine T. (2010). Margaret A. Simons, ed. Feminist Interpretations of Simone de Beauvoir. Pennsylvania State University Press. pp. 150–2. ISBN 9780271041759. ↑ Bowen, John R. (2010). Why the French Don't Like Headscarves: Islam, the State, and Public Space. Princeton University Press. p. 219. ISBN 9781400837564.